A new resource for the 2008 OCR specification providing supportive features and increased flexibility in teaching OCR A Level Science. The trusted choice for the 2008 OCR Specification. 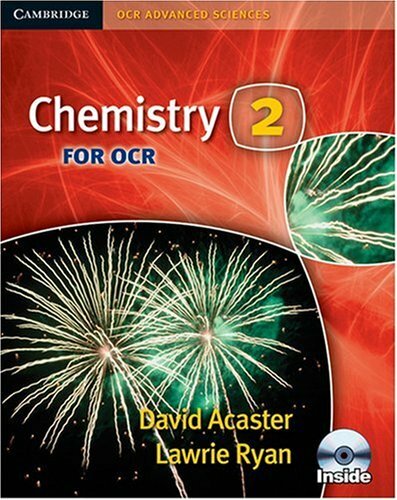 Chemistry 2 clearly explains concepts and is supported by a CD-ROM in the back of the books that provides extra information and links to a free website full of e-learning activities. The book comes with an interactive PDF CD-ROM that provides extra information for rapid advancement for pupils requiring it, without creating a heavy and intimidating book. The CD-ROM links to a free website full of e-learning activities, promoting independent and extension learning. The trusted choice for the 2008 OCR Specification. Chemistry 2 clearly explains concepts and is supported by a CD-ROM in the back of the books that provides extra information and links to a free website full of e-learning activities. The book comes with an interactive PDF CD-ROM that provides extra information for rapid advancement for pupils requiring it, without creating a heavy and intimidating book. The CD-ROM links to a free website full of e-learning activities, promoting independent and extension learning.